Currently, hundreds of products are marketed with “whole grain” statements, despite ambiguity concerning the regulatory status of descriptors such as “good” and “excellent” source. Manufacturers will not have the option of handing recalls quietly. Information may even appear on FDA’s web site. As the legislative year grinds to a halt, here’s what’s left – and what will be on the table when things pick up again. The agency’s proposed budget may mean an end to the efficient and speedy Food Contact Notification Program … and two- to five-year waits for reviews. Two associates of Washington law firm Keller and Heckman LLP listened in on an FDA audioconference about the Food Protection Plan presented Nov. 6. A “natural” claim for foods is still subject to uncertainty over standards. Food safety issues are changing consumer shopping behavior, according to News & Trends Editor Diane Toops in her monthly installment. It will be a long time before what I’m calling “the China Syndrome” ceases to be a newsworthy issue in food processing. ‘Fresh,’ organic and other consumer trends are elbowing out some traditional technologies. But there are new techniques to keep food safe and salable. 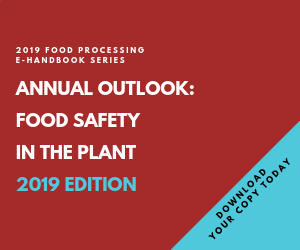 No matter what branch of the food and beverage industry you’re in, the types of products you manufacture, or the size of your company — product safety is every producers’ first priority. Food Safety: What's the big deal about HACCP and uniforms? In this exclusive interview, Al Baroudi, Ph.D., president of president of Food Safety Institute International, discusses what drives his relentless pursuit of food safety and what makes handling of uniforms a critical control point. Employee hygiene goes ‘hand in hand’ with food safety. They’re not a regular part of plant clean-up chores, but pests are a constant challenge to plant hygiene and obviously are a critical component to keeping any plant truly hygienic. This article from Aramark Uniform Services explains how uniforms can help enhance plant security as well as product safety in food processing facilities. New and improved means of keeping your plant safe and clean — at lower cost. Food safety is still the chief concern of processors, but the ‘green’ trend shot up the charts too; 77 percent see growth this year. Once again, food safety is manufacturers’ No. 1 concern — but Osama, Katrina and Reddy Kilowatt are out there, too. Food safety is still everyone’s top concern, but recruiting workers to make our food is a growing worry. New packaging techniques for meat and poultry take consumer desires — and fears — seriously. Foodshare, Inc. adopted AiroCide PPT, a NASA-developed air purifying technology to reduce perishable waste and increase food safety in its produce cooler.